38.4 turkey dinners would cover the cost of a two-bedroom in San Francisco. In an effort to encourage saving for homeowership, millennials are sometimes advised to give up certain luxuries. (All those pumpkin spice lattes add up after a while!) But would anyone be willing to give up Thanksgiving dinner? 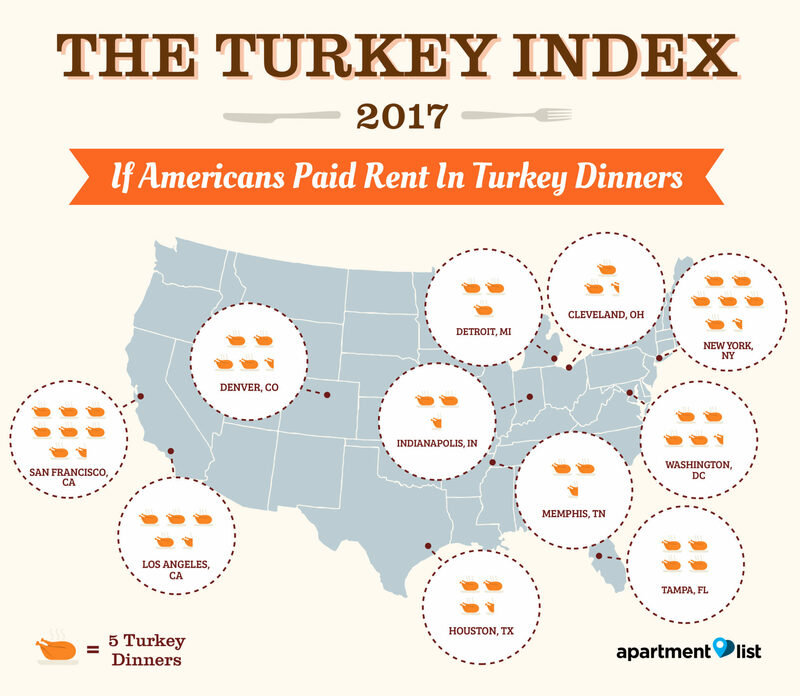 According to Apartment List’s yearly Turkey Index, which determines how many turkey dinners it would take to pay the median rent for a two-bedroom apartment in 812 cities, it looks like the cost of this Thursday’s grub can add up to pay rent if you multiply that cost by a pretty hefty number. The Bureau of Labor Statistics says the national average price for a Thanksgiving dinner that includes turkey, stuffing, a vegetable, mashed potatoes and apple pie is $63.84. But when the cost of living in each city is factored in, the price can be as little as $54.39 (Houston, Texas) or as much as $105.66 (Honolulu, Hawaii). San Franciscans would have to give up a whopping 38.4 turkey dinners to pay the rent for a median-priced two-bedroom apartment ($3,070). Renters in other notoriously expensive California metros, such as San Jose, San Diego and Los Angeles would have to give up gobbling up 32.2, 27.5 and 23.4 Thanksgiving dinners, respectively, to afford rent. Meanwhile, renters in Cleveland, Ohio; Wichita, Kan.; St. Louis, Mo. ; Indianapolis, Ind. ; and Memphis, Tenn. fared much better with the median rent only being equivalent to 11.1-14.3 turkey dinners. When it comes to buying a home, the current national median home price is $247,000. In order to save up a ten percent down payment ($24,700), a buyer would need to forfeit 386.9 turkey dinners. But according to the National Association of Realtors, most homebuyers put down closer to six percent, which would be equivalent to 232.1 turkey dinners ($14,820). Maybe we can eat avocado toast instead?